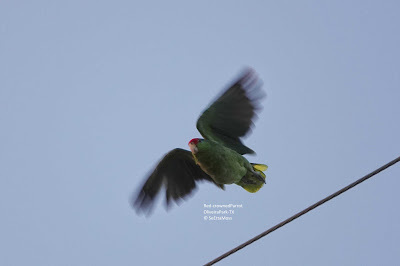 Wild Red-crowned Parrots are found only in northeast Mexico and parts of the Lower Rio Grande Valley of Texas. These parrots are in Oliveira Park in Brownsville, TX where they are known to roost in the many trees in this otherwise sports oriented park (soccer fields, baseball, tennis, etc). Do click on each pic to enlarge for better viewing. Red-crowned Parrots have life-long pair bonds and it is not uncommon to see pairs roosting or just perching together. These parrots fly into trees with a lot of cover like shown in the pic above. 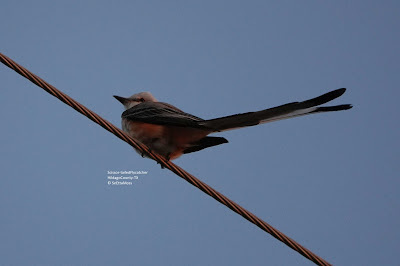 They also perch in flocks on power lines. They are quite striking when they fly as a flock as shown in the pic below. 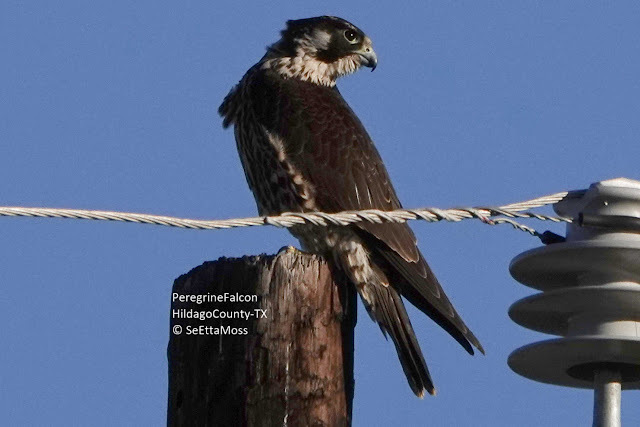 I took these photos of this juvenile Peregrine Falcon from my car, a a technique I use frequently to reduce disturbance. I was pleased to be able to get several photos and leave with the falcon still perched on this pole. Good thing I got these additional photos of the Long-eared Owl yesterday as it flew off and disappeared again today. 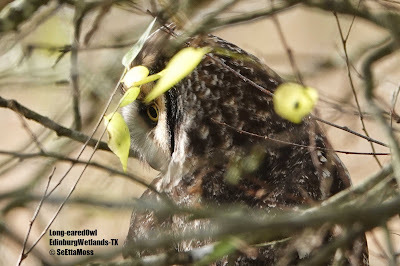 As can be seen the photos had to be taken between all the branches and leaves when the owl turned it's head so it's face could be seen. This required during manual focusing and at a level below where I could get the pics standing so I went back to my car and got my campchair. So while I was comfortable I spent about an hour watching the owl, something that was not possible during prior sightings of this species and I really enjoy getting to know species I don't often get to see. The Long-eared Owl that I posted about last week had left the location at Edinburg Wetlands where it had been roosting and had not found until today. So I went up to see if I could get some video of it. The best view is to click on 'V'at the bottom right corner of the screens below. Long-eared Owl from SeEtta Moss on Vimeo. It choose a spot that provided more of a challenge to get a clear view. If you are viewing this on a computer it will be best to view in fullscrean.